Web browsing stats are a regular news item: mobile device browsing gaining heavily on desktop browsing, IE use still outnumbers Firefox use, etc. We hear the general trends but rarely the fine details. 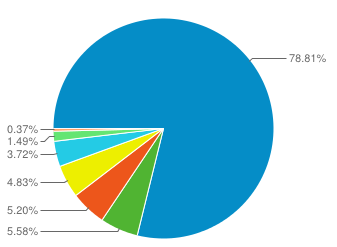 IE users continuing to outnumber Firefox users? Not within tech circles. Chrome now more popular than either IE or Firefox? Not even close for web-based content related to health (as we'll see). If you follow general web browser news you'll probably recall what was widely-reported earlier this year: Google Chrome use overtook Internet Explorer use. Months later the trend has held: Chrome use still outnumbers IE use. This suggests that IE is on its way out and web developers should begin to target Chrome compatibility first and IE second. That generalization, however, doesn't take into account specific target audiences. Are you marketing towards workers within the enterprise or state or federal agencies? Many of those workers are still using IE because it's the browser already installed and/or it's the only browser allowed by their IT departments. The more sensitive the local network, the more likely that IE is still the browser of choice (due to convention, not better browser security). From the comparison table above we see Internet Explorer is still far in the lead among visitors to a certain publicly-funded health-related website. The website is the launching pad for a number of other health websites so I believe it's a good general indicator of US health-related web traffic. Wow. 79% market share for Internet Explorer among hospital employees. It's been more than 5 years since IE had that kind of share in the general population (StatCounter data only goes back to June 30, 2008). Apple's share (desktop and mobile devices combined) is half the norm and Android hasn't even peeked its nose into regular hospital use. We see again what we already know: with regards to hospital environments, change is slow. The general population has all but dropped IE7 yet IE7 still accounts for a healthy 26% of web browsers in use by hospital employees. IE6 also still eeks out an existence somewhere out there though I'm not sure I'd care to seek treatment at a facility relying on web browsing technology from 2001 that has known security issues and which the browser developer is actively attempting "kill" the version and completely remove it from use (Microsoft estimates 6% use of IE6 worldwide compared to StatCounter's < 1% estimation). In these examples we find generalizations about browser usage are way off base for the given target audience. Know your target audience and use data that's relevant. Even if you can't lay your hands on data specific to your audience it helps to know that generalizations don't tell the whole story. If you don't have good intel when launching your web project then it's extra-critical to collect good stats on your own and be prepared to act on them over time.